Counties covered: Berkshire, Buckinghamshire, Hampshire, Kent, Oxfordshire, Surrey, Sussex and Wiltshire. Jamie is currently also covering the South West region. Deer species present: roe, fallow, sika, red, muntjac. Key issues: High deer densities, high human population and traffic density. Large areas of important woodland and heathland habitat. 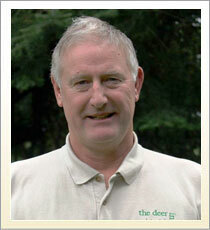 Jamie Cordery co-ordinates the Deer Initiative’s work in the South East. High human population levels and traffic densities, coupled with high deer densities in many parts means that deer-vehicle collisions are a particular issue in the South East, with some of the UK’s worst collision hotspots. Jamie also has a specific role leading the development of Best Practice guidance and he provides an important link with national standards for skills and training in the sector. There are three Natural England priority protected sites in the South East, deer work began in the winter of 2006 and most units on the sites are now in a "recovering" condition. The Deer Initiative attends or chairs the meetings of 10 deer management groups in the South East and where appropriate we work with groups of landowners to support the collaborative management approach to deer control. Jamie Cordery, the South East DLO is also the Project Officer for the Best Practice guides project. The official launch of the project was hosted by the CLA in December 2009. Best Practice is promoted (and in some cases further developed) through training events and seminars, including those on deer impact assessment and risk assessment for deer managers. Jamie also helps ensure that Best Practice is coordinated with the National Occupational Standards and the DMQ Deer Stalking Certificates, acting as vice chair for the LANTRA Game industry group and as chair for the DMQ Quality Assurance group. The deer sector nationally is indicating a willingness to work together and this coordinated approach is key to maintaining and promoting consistent high standards. DI supports the South Downs venison project. The incidence of deer-vehicle collisions is high throughout much of the South East including Ashdown Forest area which is one of the worst hotspots in the UK. A collaborative project has been set up to deal with this issue.